Val Demings and the Brady Campaign establish their solidarity with the #Resist crowd, that is with those who oppose the predominant principles and values of Americans living in the "red" states and counties of "Flyover Country." "A year after Orlando Pulse nightclub shooting, we're going backward on guns," a USA Today editorial by Democrat Rep. Val Demings asserts. "How many more times do we have to see the words 'mass' and 'shooting' next to each other before we take action? How young do the victims have to be before we take action?" What "action" does Demings have in mind? She's not ready to show all her cards, because if too many people get wind of the end game, they're not likely to believe the "No one wants to take your guns" lie. 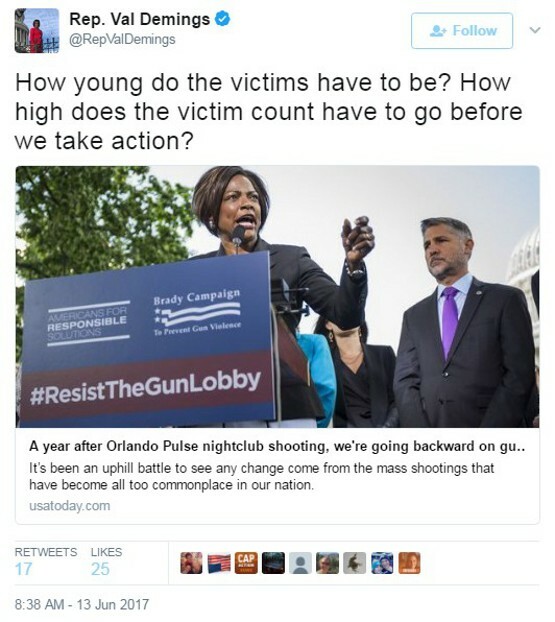 Of course they do (as the gun-grabbers used to admit before figuring out they'd get more mileage pretending they were all about "gun safety"), and so does Demings. But she's counting on most of her readers not to have plumbed the depths too deeply to realize that when she's talking about veteran and Social Security recipient disarmament, she's really talking about undermining the fundamental principle of due process. And when she opposes proposed bills to relax restrictions on the right to keep and bear arms, nationwide concealed carry reciprocity and an end to federal restrictions on hearing-protective suppressors, she's arguing for prior restraints on that which, per the mandate of the Second Amendment, "shall not be infringed." . "I served in law-enforcement for 27 years, four years of that as the Chief of Police for the Orlando Police Department," Demings says, as if that establishes her bona fides as the arbiter of rights. "Before being elected to Congress I spent most of my adult life wearing a uniform, a badge and carrying a gun. I took an oath to protect the innocent from dangerous people."